US retail sales came in stronger than expected on Thursday giving a boost to the dollar. 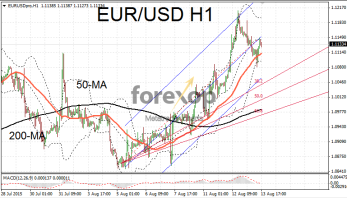 EUR/USD showed a sharp pullback after yesterday’s strong gains. 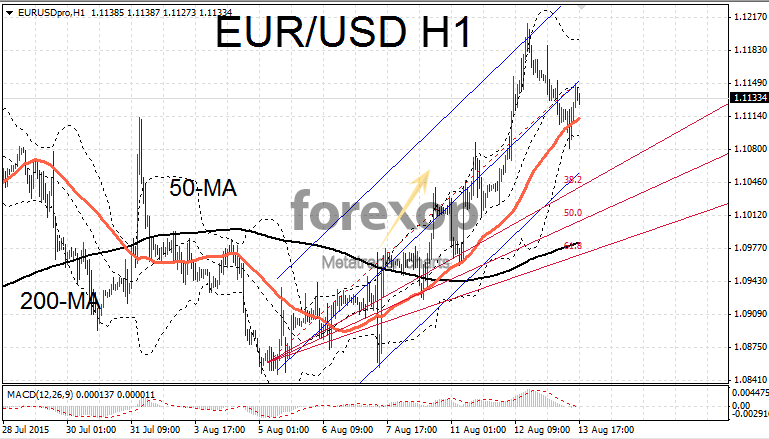 EUR/USD was trading down into the 1.10 area again falling around 0.5% on yesterday’s high. This comes after breaking above the 200-day moving average for the first time in more than one year. On the hourly chart the pair remains firmly within an upward ascent channel but given the strong recent gains a short term retracement cannot be ruled out. The data released by the US Census Department showed retail sales grew by 0.6% month on month to July. This topped the forecasted 0.5% rise and offered additional evidence that the consumer sector, which contributes a significant amount to the overall US economy, remains cheerful. Excluding the autos sector which tends to be highly volatile, the core sales were slightly less than anticipated at just 0.4%. On the inflation front, the latest reports showed import prices falling again in June. The change in the cost of imported goods fell to the lowest level in 6 months. Imported good prices fell by 0.9% in July contributed mainly by sharp falls in the costs of raw materials and energy. The data was seen as further evidence that the strong dollar is having the effect of “importing deflation”. This being felt as products and services sourced in other currencies provide downward price pressures. The week’s jobless figures also provided a minor disappointment. According to US Labor Department figures there were 274,000 people seeking unemployment support to the end of last. This was a rise of 5,000 on the previous week. Longer dated treasury yields nudged upwards in a sign that the strong retail sales numbers offered further confidence that the economy is robust enough to withstand the first hike in interest rates for nine years. The currency intervention by Chinese authorities however creates a degree of uncertainty. Overall though markets remain confident that the Federal Reserve will begin to rase interest rates in September – with possibly one further small rise coming before the end of the year. A recent poll by Reuters has most analysts forecasting the first rise will take place at the Fed’s meeting next month. From the Eurozone the economic news continues to be fairly benign and not prone to move markets. In Germany inflation figures came in at the estimated mark. The harmonized index of consumer prices, equivalent to core price index, came in with a 0.3% rise in July. French and Spanish inflation figures also came in broadly in line with expectations and consistent with a moderate inflation picture across the Eurozone.